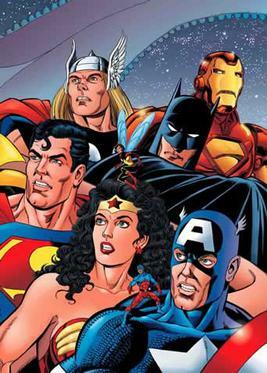 Is there a plan in the works to combine the DC/Marvel Universes into a single movie? Somehow getting Batman, Superman et al (Justice League) into a situation somehow in which they would meet Hulk, Thor, Captain America, et al (Avengers, Guardians)? Anyone hear rumor or a studio leak of any such plan...? If this is actually old news, my apologies for being behind the times. Perhaps some sort of parallel universe plot can be used with a rift between worlds opening, or somehow the two universes collide and combine rather than are destroyed. 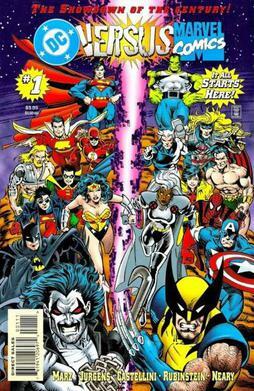 Or the two universes are being pushed to the edge of collision by some truly super villain and it takes a combined effort by both teams to either prevent a collision or modify so both universes safely coexist (or remain safely separate forever). The movie will be called "Captain America vs. The Illegal Alien", with Superman as the illegal alien. What makes it even better is that the actor playing Superman is a foreigner posing as an American. That’s the sound of the new, progressive Captain America defending illegal aliens against a group of militia members in a new politically-charged version of the legendary comic book franchise released on Wednesday. The action — and the political preaching — unfolds in the Marvel-produced “Captain America: Sam Wilson #1,” as noted in a video released by the MacIver Institute. In the issue, Captain America beats up members of a white supremacist militia called the Sons of the Serpent as they attempt to apprehend a group of illegal aliens crossing the desert from Mexico into Arizona. In this new release, Steve Rogers has lost his powers and is replaced by Sam Wilson, known currently as The Falcon. I also realize that yours was a rather good tongue-in-cheek comment, too...! My reply was to show how fast the Marvel comic world is changing and even keeping up with "touchy" political issues. But back to our movie, already in ... planning? Not unless Disney buys DC. I hope the don't. Two universes are better than one. Wow, I am really behind (like, 1960's behind)! This is never going to happen in our lifetime. Well at least not this generation of live action universes. If there ever will be this kind of project, the best we can expect is a direct to DVD collaboration between Warner Brothers Animation which handles the DC animated films and Disney. It's safe to say that it will not touch upon either current or future DC/Marvel Universe storylines or cast any of the associated A list actors involved in today's franchise. It will likely be a standalone movie or miniseries of sorts. Might be fun but the budget and thusly the production values will not be particularly grand. I don't see the DCEU as worthwhile; Man of Steel was a good starting point, but then BvS derailed Superman's story (although BvS isn't a bad movie at all, it just wasn't appropriate). As for the MCU, I'm not a fan. Individual movies like the first Thor and The Winter Soldier are good, but beyond that the universe is littered with tedious and tepid movies (Guardians of the Galaxy, Age of Ultron, Civil War, Iron Man 2 and 3, Ant-Man, Thor The Dar World). I would've just preferred a Superman trilogy. Not really, it was the least historically accurate biopic of Stalin I've ever seen. Apart from Chipmunks the squeakel. Move over Marvel/DC there's some new heroes in town.